Import Import / Select an application that uses a user-defined class or attribute in a filter / Click on "Next" Click on "User-defined attributes on the target system" User-defined attributes on the target system / Assign an attribute from the target system, Click on "OK" Click on "Next"
This dialog is shown when an imported application contains user-defined attributes or classes, which are used in filters, for example. These attributes have to be assigned to an attribute with the same name. If this dialog is cancelled, then the entire import process is cancelled. Displays the name of the attribute from the exported application. Displays the data type of the attribute. Displays the column name of the attribute. The corresponding information about the status is shown when you move the mouse over the symbol in this column. 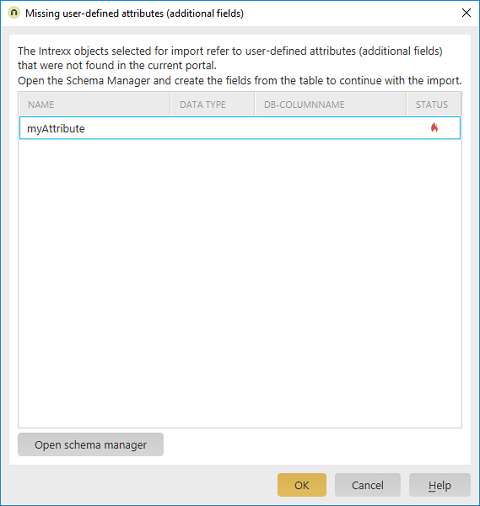 Opens the schema manager where missing fields on the target system can be created, if you have the corresponding permission.